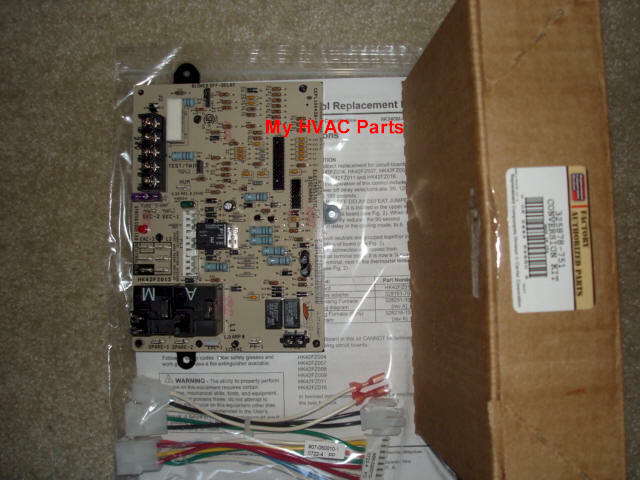 Carrier Models 58PAV, 58RAV 80% Furnace Circuit Board since about 1998. ( Also may work on Bryant/Payne and Day & Night ) Check numbers on your existing board below. This is a Carrier approved replacement for existing Board Numbers: HK42FZ004, HK42FZ007, HK42FZ008, HK42FZ009, HK42FZ011 and HK42FZ016. Check your existing board for any of these numbers. Carrier as well as MOST manufacturer's are supplying "Conversion" control boards that will replace most of their older boards in an effort to cut down on their costs, but it is also to simplify the vast numbers of boards out there which is VERY confusing to all involved. Includes the new Conversion Kit as shown below. Kit comes with all wiring harnesses, full Carrier instructions, wiring diagrams and LED Code sticker to attach to your equipment. We have sold MANY of these kits to people with no calls for technical service since these instructions are very well written! You DO however have to have some electrical and or mechanical skills to do this. If you don't feel you have these basic skills please buy the board but have an HVAC Company install it. ALSO SEE A GENERIC VERSION OF THIS KIT AT THE LINK BELOW. This is the same part but at a much lower cost.